Available in 2 x 2 mm DFN and 2.8 x 2.9 mm TSOT packages, Model NCD2100 features tuning ratio of 5.7:1 and capacitance range of 6.6–37.55 in 63 fF steps for shunt configuration. Digitally controlled capacitance trimming information is communicated via 2-wire serial bus, with calibration value stored in internal, non-volatile memory. Operating from 2.5–5.5 V, capacitor is suited for VCXOs, crystal oscillators, tunable RF Stages, RFID tags, industrial wireless control, and filter banks. 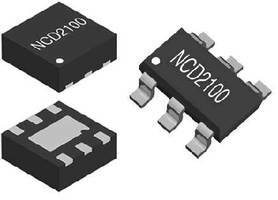 Beverly, Massachusetts, USA – IXYS Integrated Circuits Division (ICD), Inc., an IXYS Company, (NASDAQ: IXYS), announced the availability of the NCD2100, non-volatile digital programmable capacitor. The NCD2100 is a dedicated electronic calibrator for capacitance critical circuits, a typical example of which is capacitive offset trimming of a crystal oscillator. Digitally controlled capacitance trimming information is communicated via a two-wire serial bus, with the calibration value stored in the internal, non-volatile memory. The NCD2100 has a tuning ratio of 5.7:1, and a capacitance range of 6.6 – 37.55 pF in very small 63 fF steps for shunt configuration. The device will retain the programmed capacitance value stored in its internal non-volatile memory, which becomes the ideal solution for trimming purposes. Restoring this memory to its initial factory default code is also possible, so that future corrections are possible to manage system variations as aging or re-tuning processes. Other features include: very small size, minimum current draw, wide operating voltage range from 2.5V to 5.5V, and MSL 1 rating. The NCD2100M and NCD2100T are available in production quantities. OEM pricing is $0.84 and $0.82 respectively, in quantities of 25KU.